The Penguins signed veteran goalie Brent Jonhnson to a one year contract today, solidifying their goaltending for next year. 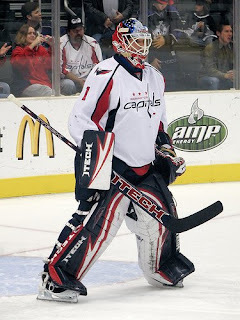 Johnson is an 11-year veteran who has played with the St. Louis Blues, Phoenix Coyotes, and most recently, the Washington Capitals. In 247 career games he has a .903 save percentage and a 2.63 goals against. Johnson has also played in 12 playoff games and has a .931 save percentage and a 1.84 GAA in those games. Details of the contract were not yet known, but no doubt, GM Ray Shero has worked another deal that will benefit the Penguins tremendously. Brent Johnson is a stellar veteran goaltender and will allow Marc-Andre Fleury to have some more time off next year without having to worry about the quality of the goaltending going down. Signing a quality backup goaltender was the final big need for the Penguins this off season and again, Shero is on top of things.